I am at a workshop all week long. It is a design course. We are learning so much but we are so tried at the end of each day. No time or energy left to make a good post and no photos to show you yet. Most of the work is still paper so far. Maybe by the end of the week. 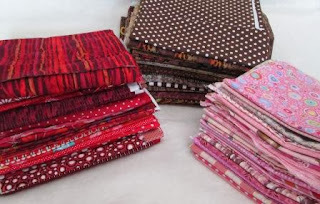 The piles of Brown, Pink and Red are a new project. Log cabins. You will have to wait and see. who are you taking a workshop with?